My sisters and I had breakfast together yesterday. In our busy lives, it has been really hard to take time out to visit with each other. Years ago I had suggested making a monthly family breakfast, and I’m actually glad this is hopefully becoming a priority. Although our breakfast gathering was only for an hour and it was just the three of us this time, we were able to enjoy each other’s company. I’ve learned over my 50 years that if you don’t actually schedule something and make an effort to make it happen, it never will. Part of the conversation was about my husband thinking of selling our boat. We have owned a boat for over 30 years. Jim is a true Pisces, and when we were first dating, he purchased a 21’ Mark Twain. It had a little cabin and a porta potty. Although very minimal, we had everything we needed while it was just the two of us, spending many days on the water and many nights sleeping out. Our three kids grew up on that boat and at the beach, and the stories that boat could have told! All of the years of fishing (or trying to fish but not catching anything), the sinking episode, the rainstorms we got caught in. The kids grew up on that boat, rushing to “suicide hill”, a fabricated name for a huge pile of sand near our dock. We had that boat for almost 20 years. Jim had always wanted a little bigger boat, one that would be more convenient for our family with a little kitchen area and a real bathroom space that didn’t require taking the whole boat apart to get to. Then September 11 happened. If you have read things I’ve written before, sometimes, I believe, it takes a life event to provide the motivation to make today a “someday”. I’ll explain. So many times I find that we may say “someday I’ll do this” or “someday I’ll do that”. We can say “it”, we can plan “it”, or we can make “IT” happen. That October, as a result, I obtained a home equity loan and made “it” possible. We purchased a larger boat that was able to accommodate the needs of our family convenience- wise, although it did reduce the portability of the boat. As a side-note, and something that wasn’t planned as the Time to Play project wasn’t in existence at the time, the used boat we purchased came with the name “It’s All About Time”. This is a super strong message about priorities — the need to take time to enjoy life — that I coincidentally wrote about in paragraph 1 when I began this article. Anyway, after the years following September 11 to the present, the kids are pretty much never with us and the boat is not used as much as it had been. With that, my sister, who has two younger boys, discussed a recent conversation with her husband about getting a bigger camping trailer. FINALLY: The point of this article after this whole, long introduction: What “stuff” do we need? A few days ago Keith Richards Godwin, one of our valuable Time to Play Foundation team, invited me to be a guest on his recovery radio show on 103.9 FM LI Talk Radio. 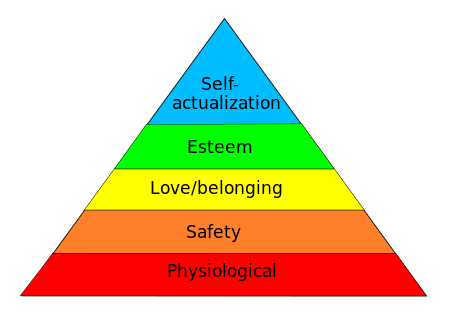 On the show we had a brief discussion of Maslow’s hierarchy of needs and the pressure society puts on us to have “stuff”. We discussed how we needed to question if we, personally, have our basic needs being met including shelter and food, as well as if we really needed all the “stuff” our society tells us we need. Certainly there is tremendous pressure on us to have things, but I have learned that things don’t make us whole. At this point in my life, I have realized that anything I have needs to fill a purpose to compliment my life or to make something in my life easier. I have learned that things are not a substitute for love or fulfillment, and cannot fill the basic needs we each have as a living and breathing human. Years ago I heard a skit by, I believe, George Carlin, where he discussed how we live in a box where we never are because we are always working, work in a box, and pay for our car, another box, that we drive from our house box to our work box and park outside in a parking lot while we work. I never forgot the message, which always comes to mind before I purchase something. I wanted to share a video of the message here, but the best I could find when I Googled was this excerpt from one of George Carlin’s performances about “stuff” https://youtu.be/MvgN5gCuLac. Back to the breakfast with my sisters and our discussion: our boat is long paid for at this point, so this “stuff” we have only costs yearly maintenance and dock fees. My sister would have created another payment for her family that she would have had to work harder to cover, so she and her husband decided it wasn’t necessary to get bigger “stuff” right now. Benefit analysis is pretty important when any purchase is considered – for example, why do you want the “stuff”, will the “stuff” enhance and compliment your life? Will it fill a purpose to make life better or more enjoyable? Don’t get me wrong, I love “stuff”. But now, my intention is to get “stuff” that I will use to add to my life’s enjoyment. There is no “stuff” that can fill any type of void in my life. And, of course, remember the saying, “You can’t take it with you”. There’s nothing wrong with wanting or striving to get “stuff” that will add to life enjoyment. It’s part of the joy in life, and why people make “stuff” in the first place! I’m actually leaving this morning to go to Connecticut to pick up my new used motorcycle today, which will absolutely add to my life enjoyment this upcoming riding season. I guess the message I’ve been trying to communicate here is don’t stress to get “stuff”. Don’t put pressure on yourself to get “stuff”. Not adding pressure to my life is a message I still have to remind myself of frequently. I have found that pressure and stress lead to obstacles, and that life should focus on happiness and enjoyment. I hope this helps spark a thought in you, and that you pass this on to someone else who may need it. Congrats on Building Your Dream!